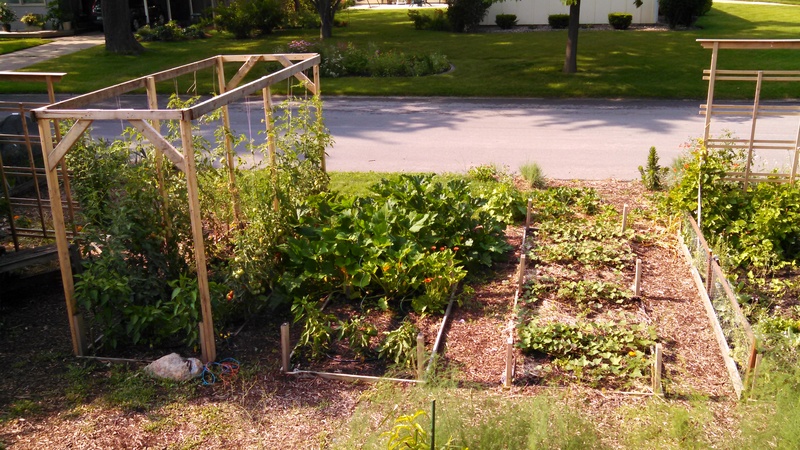 This morning I laid in bed listening to passersby walking or biking down our street commenting on our garden. A few minutes later I was walking through the garden assessing the impact of the overnight rains. I pulled a few weeds to feed to the livestock and ended up chatting for a while with the custodian from our building at work just happened to be biking by. When your garden is mostly just off the street, garden tasks are often intertwined with neighborhood tasks. Backyard gardens, backyard chickens, backyard grilling, backyard pools. A couple of Sundays ago Ana Caughey reported back to Twin City Bible Church about her first experience joining us on the youth mission trip to East St. Louis. She commented on how she noticed the folks in East St. Louis spend their leisure time on their front porches and visiting with neighbors. We often spend our time in our backyards with our immediate family but closed off from our neighbors. Gated communities are exclusive neighborhoods with carefully controlled access. Something about them has always been off-putting to me. They seem the opposite of how I understand Jesus lived in the world, and as a follower, seem the opposite of how I should live in the world. But is it possible that we’ve made the backyard a more palatable, but still problematic, equivalent?